Social platforms have become an ever-evolving medium. And basic web marketing just doesn’t cut it anymore. A business with a mere simple website cannot compete with a business that has an immersed social, local, mobile audience, interactive Twitter conversations, savvy mobile engagement. Technology today allows you to connect and ignite a very targeted and specific marketing relationship with your clients. But even though Social-Local-Mobile (SoLoMo) marketing is clearly the future, thousands upon thousands are getting left behind, using obsolete methods to reach their customers. The idea of SoLoMo marketing is actually pretty simple. If you walk into your local Starbucks, you will see one unifying idea: Nearly everyone has a mobile smartphone, and they are very much attached to that device. SoLoMo marketing capitalizes on this. Through mobile websites, mobile apps, text message marketing, and various social media platforms, a business owner can go where the customers are. And, no, they aren’t surfing the Yellow Pages or their local newspapers; they’re looking for businesses like yours on their mobile devices, and they are possibly ready to purchase your product. Your SoLoMo campaign relies on the mobile arena. 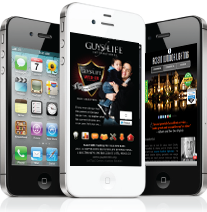 You need to make sure that your websites are mobile-optimized. A mobile website fits the screen, makes it easy for the user to navigate your pages, and has clear, succinct information about your business. If someone finds your regular site on their mobile phone,a script needs to redirect that user to your mobile site, so that your customer can access your mobile site quickly. The beauty of SoLoMo marketing is the sheer simplicity of it. You can connect with your local audience on a personal level by using social media, while profiting from buyer traffic that mobile technology brings. But please understand: It’s more than just Facebook, Twitter, or your mobile site. At the end of the day, it’s marketing. It’s not a “one-size shoe fits all” miracle solution, it’s knowing where your customers are and giving them exactly what they want.